The CIBC Aerogold Visa Infinite Privilege Card currently has an Informr score of 10 out of 10. This score is based on our evaluation of 1 sources including reviews from users and the web's most trusted critics. 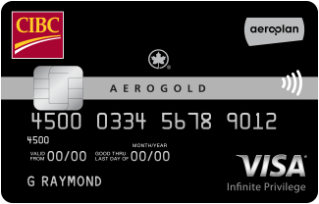 CIBC Aerogold Visa Infinite Privilege Card is typically available to those with good credit scores (650 or greater). You get exclusive Air Canada benefits that are applicable to all Air Canada flights, not just Aeroplan reward flights. That includes priority check-in, priority boarding and complimentary first checked bag. On purchases within the first 4 months. In addition, earn 25000 bonus miles on your first purchase.